Experience: The Blog: The Lure, Opportunity and Danger of "Social Selling"
The Lure, Opportunity and Danger of "Social Selling"
The term "social selling" has been around a while, but suddenly it seems very hot. I have been asked about it four times in the past few weeks, and the term has recently appeared in my tweet stream quite a bit. What is social selling and why has it become a hot buzzword now? The definition is obvious--using sales techniques in social media channels to increase revenue--but why is the term "social selling" on the tip of so many tongues today? I think the interest in social selling is just another way of probing the ROI of social media, a question that never goes away despite the fact almost 100% of marketers are today deploying social media tactics. For some, the thinking seems to be that building community, enhancing reputation and creating advocacy is nice and everything, but if social doesn't help brands increase sales, what good is it? Of course, social media can do lots of good aside from increasing sales. It can furnish research, decrease customer service costs, improve customer retention, decrease return rates, improve awareness, protect and build reputation, furnish stronger collaboration with customers and vendors, combat incorrect information and multiply word of mouth, all of which are beneficial business outcomes that are not directly measured in sales. Social can also enhance sales with strategies that do not explicitly fall under the category of "sales"--for example, social campaigns can increase site traffic, ratings and reviews can improve ecommerce conversions and communities can increase share of wallet. 81% of consumers have either "unliked" or removed a company’s posts from their Facebook News Feed, with 43% saying their wall was becoming too crowded with marketing posts and 24% saying posts were too promotional. 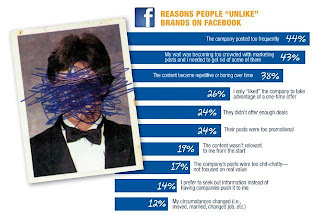 And, perhaps most interestingly, while 51% of consumers said they expected that "likes" would result in marketing communications from brands, a whopping 40% did not believe it should result in marketing communications. Think about that--four in ten people who "like" your brand still don't want you to try to sell them something on Facebook. Of course, there are circumstances in which consumers will welcome selling, and this depends on two factors--context and relationship. If a consumer enters your company's space by walking into your store, visiting your retail web site or posting a product question via a social network, they have expressed an interest in receiving information and stated an intent to consider a purchase; in this context, selling is welcome. Many social media strategies are designed to improve inbound marketing so that consumers themselves create the context for sales opportunities. The other factor that increases a consumer's desire to be sold to is relationship--does the consumer recognize, know and trust the brand or sales representative? Consumers welcome brands and people who are partners, help improve their lives and bring value, but they are no more likely to accept sales queries (in social media or elsewhere) from entities they do not know than they are to welcome a telemarketing call. Last year, an About.com study found that 84% of respondents reported they will not engage with a brand until trust has been established. Whether or not social media is a fertile venue for selling has less to do with the medium and more to do with what your brand and associates do to create trusting relationships and recognize when the context is appropriate. "Social" is not a magic word that converts distasteful and disagreeable sales tactics into something desirable and effective. In 2013, the risk with social selling is that companies could become overly assertive deploying a new breed of social CRM tools that use social listening systems to identify consumers experiencing key life and money movement events. If companies use these tools to target smart and personalized messages to people with whom they have a relationship, these tools can improve social selling; however, if companies misuse these tools, the outcome could be an onslaught of spammy auto-posts that do more to offend than to motivate transactions. If a hundred companies using the same social CRM tools all reach out to a consumer following his or her post to friends about a pregnancy, birth, graduation, job change, retirement or relocation, the result is not likely to be improved sales but unfriended and blocked brands, spam reports and damaged reputations. This is why relationships, as always, matter. Social doesn't revolutionize sales--if anything, it reinforces the importance of traditional value-based relationship building. Brands that wish to succeed with social selling must realize that sales is a lagging indicator; the vital leading indicators are the ones that gauge the strength of relationships. If sales are a lagging indicator, what are the leading indicators that suggest a brand or sales associate is improving both relationships and social selling opportunities? Brand-building engagement--not just "fans" and followers but interactions, shares of content, community participation, etc. Social media is not, first and foremost, a direct marketing or sales channel; it is a relationship channel. And like in every other channel, relationships are not built on constant selling but on shared values, reciprocation, partnership and caring. Social selling can be successful for companies and people who invest the time and energy to build relationships, but those that bring traditional sales tactics such as cold calling and ABC (Always Be Closing) will find social hostile territory. Social marketing should aim at motivating these "sales referral" initiatives. As you probably know, I struggle to keep my blog posts to a reasonable and bite-size length. I have this habit of expanding and expanding (because the topics lend themselves to doing so.) In this case, I almost bit off the "social commerce" thing and thought better of it--like opening a whole can of worms--but I'm glad you did. At USAA, we created a maturity model where Social Commerce and Social Business were the two final states, and I agree there is a big difference between social selling and social commerce. Great Post, Augie. I thought the parallel you drew with Glengarry Glen Ross particularly interesting, considering I just saw this movie for the first time about 2 weeks ago. The most successful salesman in that movie, Al Pacino's character, is also the one that relies least on traditional sales tactics (he chats up the person in the bar for several hours before even bringing up the real estate sale). It underscores yet again that the most successful strategies in sales and marketing revolve around relationships and relationship building.